MainAll NewsJewish WorldRabbi Shlomo Riskin to join Chief Rabbinate Council? Rabbi Shlomo Riskin to join Chief Rabbinate Council? Leading religious Zionist rabbi and spiritual leader of Efrat says Chief Rabbinate must represent all Orthodox Jews reach to secular Jews. Rabbi Shlomo Riskin, the rabbi of Efrat in Gush Etzion and the founder of Ohr Torah Stone, is considering running for the position of Chief Rabbinate Council. The elections are expected to take place next month. 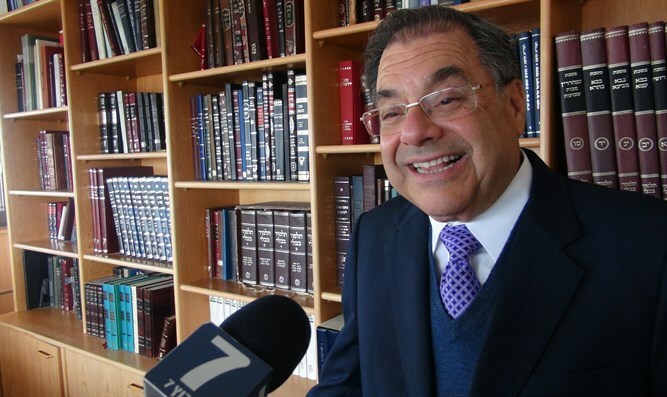 Rabbi Riskin began the process of collecting the necessary signatures from among the members of the elective assembly. "I believe in the supreme importance of the Chief Rabbinate of Israel and of the Orthodox stream that represents Judaism with a four thousand year-old tradition," said Rabbi Riskin. "But at the same time, the Chief Rabbinate, which sees itself as the representative of all the people of Israel, in Israel and abroad, must find the bridge between Torah and Halakha and people who see themselves as secular." Rabbi Riskin adds that "within the Chief Rabbinate there must be representatives of other Orthodox voices, universal and humanistic voices, who follow the path of Beit Hillel and not only in the way of Beit Shammai, voices that will respect every expression of Judaism. "The Chief Rabbinate must act as Aharon's students, loving and seeking peace, lovers of people and Torah scholars. That is why I am considering running for the Chief Rabbinate Council," said the rabbi.